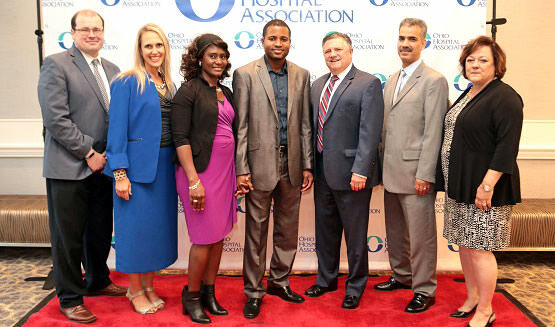 2018 Health Care Worker of the Year finalist Collins Uzuegbu, CNS of Mercy Health—Lorain Region hits the red carpet with family, friends and colleagues at the OHA Recognition Dinner. The Ohio Hospital Association each year presents several awards to celebrate outstanding individuals and achievements that have enhanced and brought honor to Ohio hospitals. Created to honor stellar service, exemplary performance and leadership, and excellent personal and organizational accomplishments within the Ohio hospital community, the following awards recognize excellence in all aspects of health care delivery including caregiving, leadership, patient and occupational safety, environmental sustainability, health care engineering and facilities management, nursing leadership and more. The prestigious award honors men and women who have made extraordinary and lasting contributions to the health care industry. Since 2015, eight health care visionaries and leaders have been honored with the well-respected distinction. Each OHA member hospital is encouraged to submit a nomination for Health Care Worker of the Year. This distinction recognizes outstanding caregivers who go beyond the call of duty for their hospital, colleagues, patients and community. OHA presents the Health Care Leadership Awards to honor outstanding hospital executives and organizations whose leadership and achievements have enhanced and brought honor to Ohio hospitals. The OHA Advocacy Awards are presented to those individuals, organizations or groups who make exemplary contributions to the health and well-being Ohioans through their leadership in the political or policy arenas. Hospitals and health systems demonstrating a commitment to environmental stewardship and energy efficiency are invited to apply for OHA's Environmental Sustainability Awards. Hospitals are invited to join the Statewide Hospital Occupational Safety Campaign as an opportunity to earn statewide recognition for improving safety in the workplace. These awards recognize workplace safety and successful occupational health programs. The Ohio Patient Safety Institute sponsors the Best Practice Award to honor outstanding patient safety improvement efforts in the Ohio hospital community. The Ohio Organization for Nurse Executives awards acknowledge honorees for their outstanding service and professional achievements in the field of nursing. The Ohio Society for Health Care Facilities Management salutes outstanding performance, leadership and significant contributions among the membership.